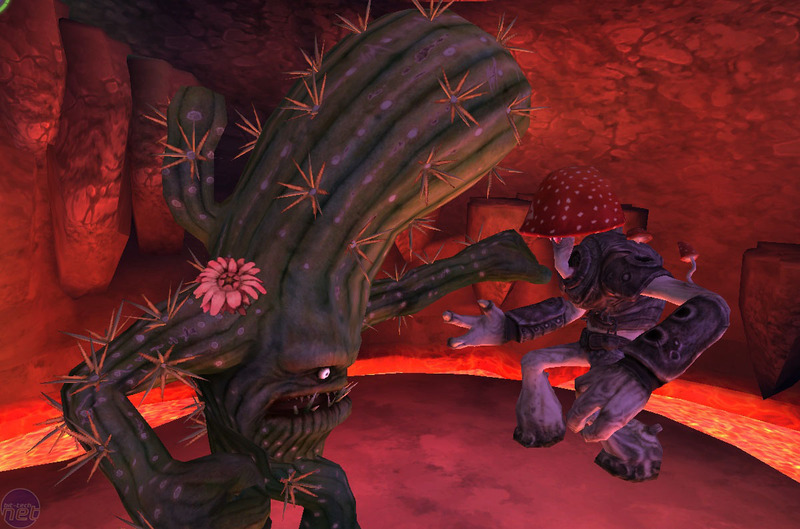 Don't ask us why, but when Mushroom Men was first announced, we were actually quite exited. The early concept art and blurb seemed to suggest that it would be at least a slightly fresh game. Armies of 'shrooms waging war with each other using toothpicks and twists of wire? It sounded like a mash-up of Psychonauts and Terry Pratchett's Nomes books – there's no way that formula could disappoint, right? This is why we started off by tell you not to ask us why we were excited by Mushroom Men; we were going to tell you anyway. Once you boot it up though, it quickly becomes apparent that the promise of fresh gameplay is one that won't quite be delivered on. Mushroom Men may have originally seemed like it was going to deliver something innovative and new, which would have been great to see even if it wasn't entirely flawless, but in reality all it is is a 3D platformer. The slightly kooky character design and concept can't hide the fact that it's only vaguely distinguishable from the hordes of other games in this genre. Nevertheless, the fiction for the game and the setting the action takes place in is pretty fun and unique, even if it's just in a childishly retro way that conjures memories of the Teenage Mutant Ninja Hero Turtles. The story begins with a simple slideshow that introduces the player to the main character, a young Sporeling called Pax. The art is fantastic and it's clear than an awful lot of effort went into designing the characters and the worlds they occupy. The slideshow tells the tale of Pax's tribe who, like most of the flora and fauna in the world, begun to gain some level of sentience (as well as muscles, intelligence, telekinesis and the ability to move) after being carpeted with mystical meteorite dust. The meteor-dust phenomena is one which is supposedly lost on the humans, who are left wholly unaffected by the brain-enhancing powers of the dust, but the smaller creatures find themselves greatly improved. Suddenly they can move freely, talk, shout...and fight. It's that last point which is the most critical and unfortunate, as Paxs entire tribe is soon wiped out like a smear of snot on the bathroom mirror. The Spore Wars erupt as the different factions and types of mushrooms begin to vie for control and Pax is left as the only survivor of his tribe. Pax does what anybody in his position would do and sets off blindly into the wide world, with naught but a walking stick and a silhouette that makes him look like a wild, wandering Ronin. Like we said; more effort went into designing these characters than went into attempting to decorate the levels of Gears of War 2 with anything except the colour brown, not that that's saying much. For the first part of the game then, there isn't any clear over-arching goal; just the efforts of this lone mushroom to try and find a place in the world now that he's been forced to grow up a bit. Soon though, the obvious happens and Pax finds himself embroiled in a quest of his very own. 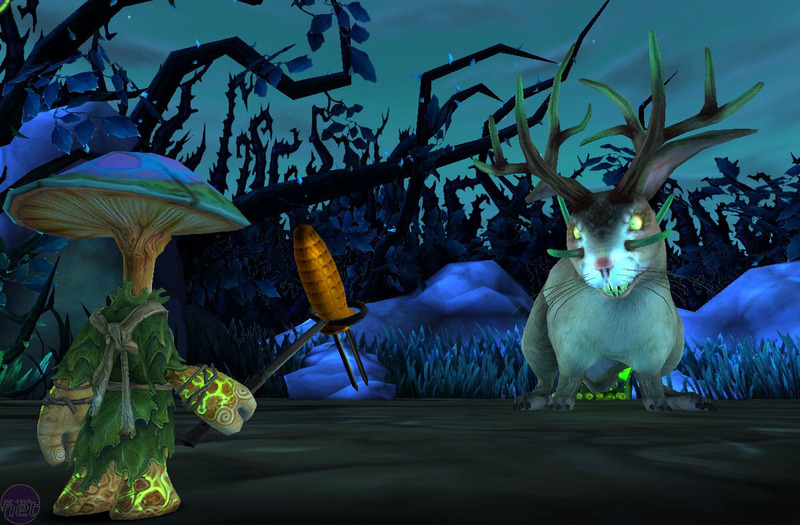 Darkspore attempts to use Spore's creature editors to enliven Diablo-style gameplay. Nintendo has confirmed that it will not be offering a retrofit of the MotionPlus Wii remote add-on, so it will only work with new games.